For the computer programming concept, see Bookkeeping code. Portrait of the Italian Luca Pacioli, painted by Jacopo de' Barbari, 1495, (Museo di Capodimonte). 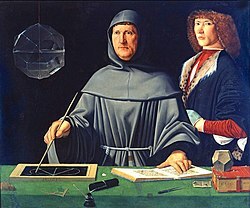 Pacioli is regarded as the Father of Accounting. Bookkeeping is the work of a bookkeeper (or book-keeper), who records the day-to-day financial transactions of a business. They usually write the daybooks (which contain records of sales, purchases, receipts, and payments), and document each financial transaction, whether cash or credit, into the correct daybook—that is, petty cash book, suppliers ledger, customer ledger, etc.—and the general ledger. Thereafter, an accountant can create financial reports from the information recorded by the bookkeeper. Bookkeeping refers mainly to the record-keeping aspects of financial accounting, and involves preparing source documents for all transactions, operations, and other events of a business. The origin of book-keeping is lost in obscurity, but recent researches indicate that methods of keeping accounts have existed from the remotest times of human life in cities. Babylonian records written with styli on small slabs of clay have been found dating to 2600 BCE. The term "waste book" was used in colonial America, referring to the documenting of daily transactions of receipts and expenditures. Records were made in chronological order, and for temporary use only. Daily records were then transferred to a daybook or account ledger to balance the accounts and to create a permanent journal; then the waste book could be discarded, hence the name. The bookkeeping process primarily records the financial effects of transactions. An important difference between a manual and an electronic accounting system is the former's latency between the recording of a financial transaction and its posting in the relevant account. This delay, which is absent in electronic accounting systems due to nearly instantaneous posting to relevant accounts, is characteristic of manual systems, and gave rise to the primary books of accounts—cash book, purchase book, sales book, etc.—for immediately documenting a financial transaction. In the normal course of business, a document is produced each time a transaction occurs. Sales and purchases usually have invoices or receipts. Deposit slips are produced when lodgements (deposits) are made to a bank account. Checks (spelled "cheques" in the UK and several other countries) are written to pay money out of the account. Bookkeeping first involves recording the details of all of these source documents into multi-column journals (also known as books of first entry or daybooks). For example, all credit sales are recorded in the sales journal; all cash payments are recorded in the cash payments journal. Each column in a journal normally corresponds to an account. In the single entry system, each transaction is recorded only once. Most individuals who balance their check-book each month are using such a system, and most personal-finance software follows this approach. After a certain period, typically a month, each column in each journal is totalled to give a summary for that period. Using the rules of double-entry, these journal summaries are then transferred to their respective accounts in the ledger, or account book. For example, the entries in the Sales Journal are taken and a debit entry is made in each customer's account (showing that the customer now owes us money), and a credit entry might be made in the account for "Sale of class 2 widgets" (showing that this activity has generated revenue for us). This process of transferring summaries or individual transactions to the ledger is called posting. Once the posting process is complete, accounts kept using the "T" format undergo balancing, which is simply a process to arrive at the balance of the account. Two bookkeeping methods in most common use today are the single-entry bookkeeping system and the double-entry bookkeeping system. Single-entry bookkeeping is adequate for many small businesses; it uses only income and expense accounts recorded primarily in a revenue and expense journal. In the double-entry system, at least two accounting entries are required to properly document each financial transaction. These entries may be recorded to asset, liability, equity, expense, or revenue accounts. The primary bookkeeping record in single-entry bookkeeping is the cash book, which is similar to a checking account register (in UK: cheque account, current account), except all entries are allocated among several categories of income and expense accounts. Separate account records are maintained for petty cash, accounts payable and receivable, and other relevant transactions such as inventory and travel expenses. To save time and avoid the errors of manual calculations, single-entry bookkeeping can be done today with do-it-yourself bookkeeping software. Dr – Debit side of a ledger. "Dr" stands for "Debit register"
Cr – Credit side of a ledger. "Cr" stands for "Credit register"
Computerized bookkeeping removes many of the paper "books" that are used to record the financial transactions of a business entity; instead, relational databases are used today, but typically, these still enforce the norms of bookkeeping methodology including the single-entry and double-entry bookkeeping systems. CPAs supervise the internal controls for computerized bookkeeping systems, which serve to minimize errors in documenting the numerous activities a business entity may initiate or complete over an accounting period. Bookkeeper (or bookkeepers, bookkeeping etc.) is the only common English word which contains three consecutive double letters. ^ Weygandt; Kieso; Kimmel (2003). Financial Accounting. Susan Elbe. p. 6. ISBN 0-471-07241-9. Chisholm, Hugh, ed. (1911). "Book-Keeping" . Encyclopædia Britannica. 4 (11th ed.). Cambridge University Press. p. 225. ^ "Pittsburgh Waste Book and Fort Pitt Trading Post Papers". Guides to Archives and Manuscript Collections at the University of Pittsburgh Library System. Retrieved 2015-09-04. ^ Haber, Jeffry (2004). Accounting Demystified. New York: AMACOM. p. 15. ISBN 0-8144-0790-0. CA Student Blog (27 April 2017). "Infographic: What are the Books of Prime Entry?". icas.com. Institute of Chartered Accountants of Scotland. Retrieved 16 June 2017.